Most of the world's earliest flags were used to represent military units. Almost all modern military groups still follow that ancient tradition, and the National Guard is no exception. Air National Guard flags are among the youngest flags in the United States Military, but they are still displayed with pride wherever the organization's soldiers gather. 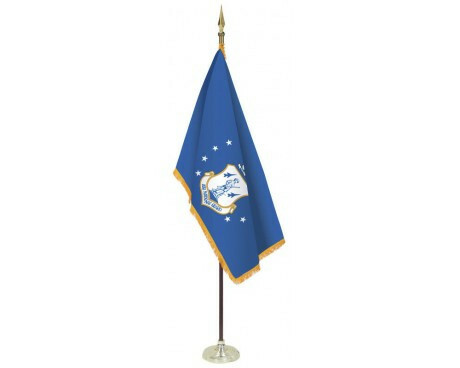 The Air National Guard flag is based on the flag of the United States Air Force, which mirrors the close ties between the two organizations within the military. The United States Air National Guard is always keeping a watchful eye on our airspace to ensure that we are safe as a country. Internationally, the US Air Force provides support and air power to many conflicts and are widely recognized as the finest air force in the entire world. We should all be proud of our airmen and women who devote their lives to our safety. What better way to show your support than by flying Air Force Flags or an Air National Guard Flag. 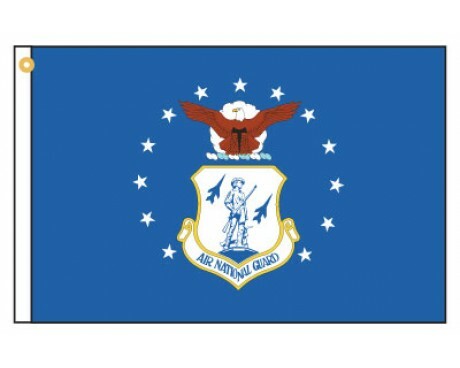 The Air National Guard flag has a dark blue field that displays thirteen white stars around the Air National Guard emblem crowned by a bald eagle. The flag can be displayed with a fringe while indoors, but the fringe should be omitted for outdoor display. The thirteen stars represent the original thirteen colonies that joined together to form the United States of America, while the bald eagle is a symbol that represents the nation as a whole. The blue field is shared with many other military and state flags within the United States, so it serves as an subtle, additional reminder of the organization's loyalty to the nation. The emblem of the Air National guard displays a minuteman standing near two planes in flight. The minuteman is a symbol of the American militia and the National Guard that dates back to the birth of the nation, while the planes emphasize the Air National Guard's role in the military. The Air Force is a relatively young branch of the military of the United States of America, and the Air National Guard is just as young. Military aviation within the United States predates the organizations themselves, but they only became separate from the Army of the United States in 1947. The law that established the organizations called for an appropriate seal to be designed and granted to them, but it would take several years for Air National Guard flags to be produced. 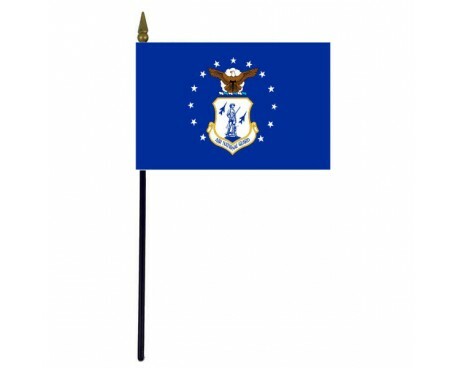 The flags were finally approved for use in 1951, and they have flown over military facilities ever since without undergoing any changes. 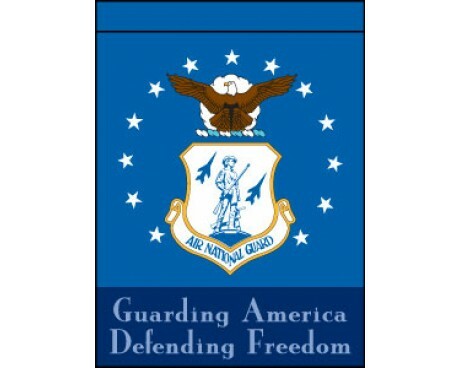 The Air National Guard was established in 1947 as the reserve branch and state militia of the USAF. 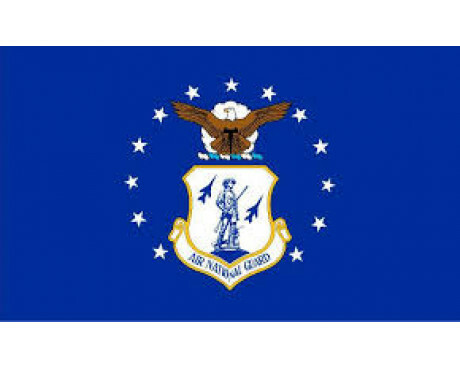 With over 100,000 personnel, the Air National Guard is a state based line of defense against air intrusions and can be summoned at the Governor level during time of need.The United States Air National Flag is very similar to the US Air Force Flags, in that it features a deep blue background, eagle with cloud and 13 white stars. Similar to other national guard flags, below the eagle is a militia man in the crest, designating the state oriented, volunteer aspect of the Air National Guard.